Illustration is that of an ideal Chagoi. A Chagoi is known as the friendly koi. 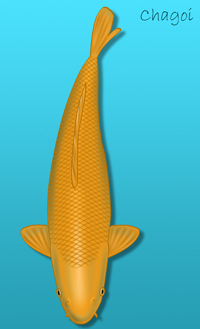 It is a single colored non-metallic brown koi. The color can vary from deep saffron to root beer and even shades of tea. Look for clean and consistent color. Chagoi is a variety that grows quite fast. It is in the Kawarigoi classification.